This year’s scorching summer is the only reason enough for you to go ahead and invest in a table fan, which offers an incredible value by working in coordination with an air conditioner to spread the cold air across the room. With a table fan, you will be able to direct the airflow towards the area you want it to and the products with oscillating feature prove to be much more useful given their ability to over a larger area. Many popular brands have a range of table fans available at your disposal and you can choose the one that best suits your needs. 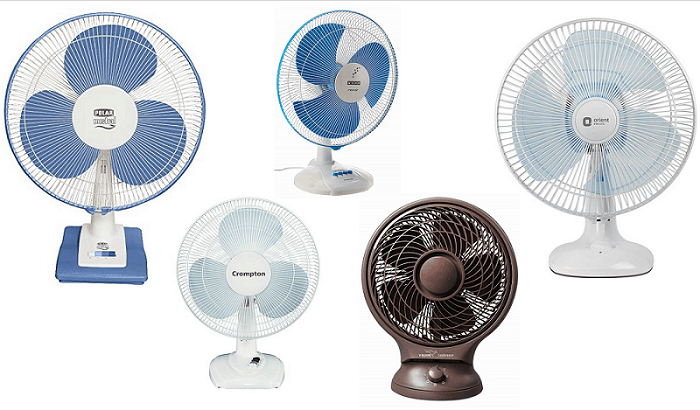 We have listed below 10 best table fans that you must consider. 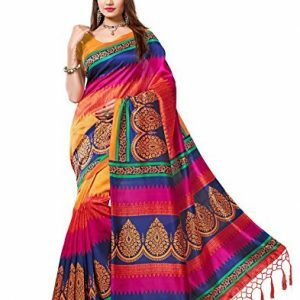 1) Indian brand Usha has established itself as a go-to brand when it comes to any kind of fans available in the market and table fans are no different. 2) This 400-watt table fan takes the top spot in our list, thanks to its superior build and the value it offers given its pricing and set of features. 3) A blue and white styling gives it a simple yet elegant look for placing it in any room. 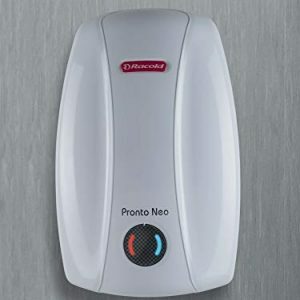 4) It has a novel base design which houses the fan controls and its wide translucent blades ensure a higher air delivery. 5) Another motor works to make the oscillation jerk free and gives uniform air across the room. 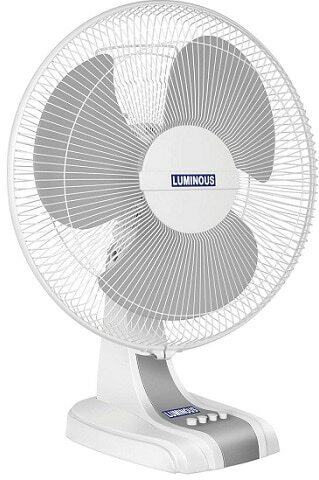 6) The fan is quite efficient with a power input of 55 watts and it comes with a brand warranty of 1 year. 1) Designed for use by a single person, this table fan from V-Guard is smaller than other products in the category given its usage. 2) It has a sweep size of 250mm, which should be quite enough for the purpose it is intended to, and it should also allow for placement in a congested space for it won’t take much space on your table. 3) Besides including the oscillating feature, the table fan also allows for manual angle adjustment with an up and down movement. 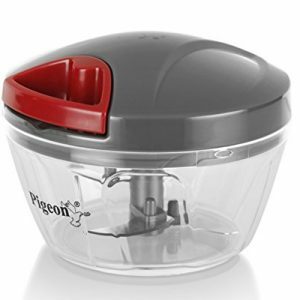 4) Rated at 40 watts for power input, the fan can run at 1200rpm offering an excellent air flow. Its stand houses a knob that lets you adjust the fan speed with up to three choices. 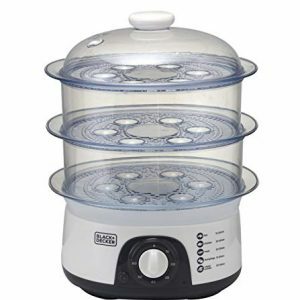 5) The compact table fan comes included with a brand warranty of 1 year. 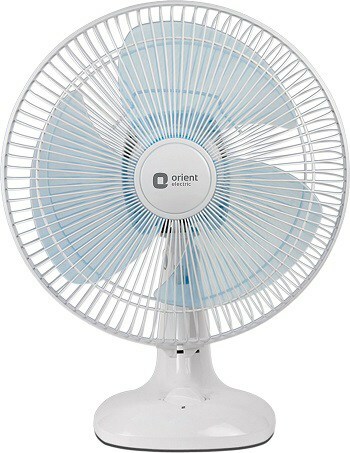 1) A medium-sized table fan from Orient comes with a span of 300mm and its blades are designed aerodynamically to offer maximum air delivery while minimizing any drag. 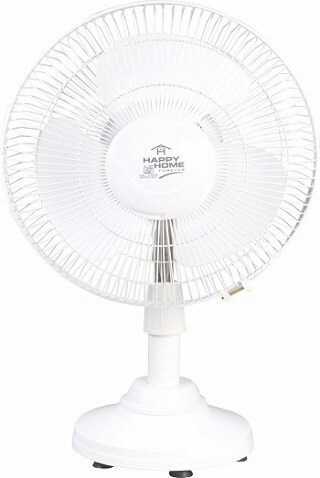 2) The fan can be used at three different speeds and a rotary switch has been included on its base. 3) A resettable thermal overload mechanism has also been included to protect the motor and ensure its long life. 4) A 90-degree oscillation is supported by this table fan and it also has a tilting option to direct the air exactly where you are. 5) It is a 90-watt fan that comes covered with a 2-year warranty from Orient along with a brand promise that should give you a peace of mind. 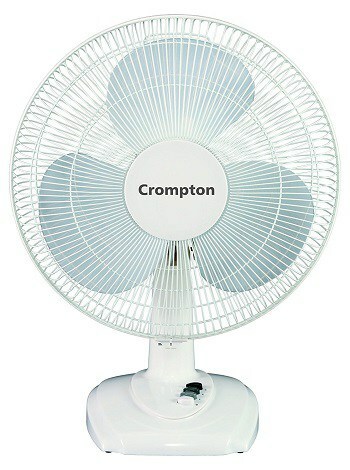 1) Sporting a much larger sweep size of 400mm, this table fan from Crompton ensures an adequate air flow covering a much larger area. 2) It has a simple yet elegant design that should perfectly fit inside any kind of room without looking absurd. 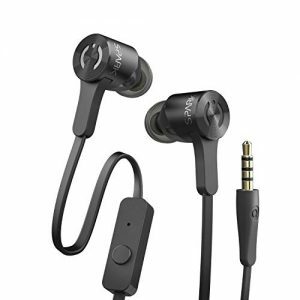 3) High-quality plastic has been used as the base material that is ideal for prevention against shocks. 4) Its fan motor can run at a maximum speed of 1300rpm offering an air delivery of 70 cubic metre/minute. 5) Given its size, a wider base has been included to keep the fan sturdy and it also houses the fan controls which are quite easy to operate. 6) It consumes just 50 watts of power and comes with a brand warranty of 2 years against a single year offered by many other products in its price range. 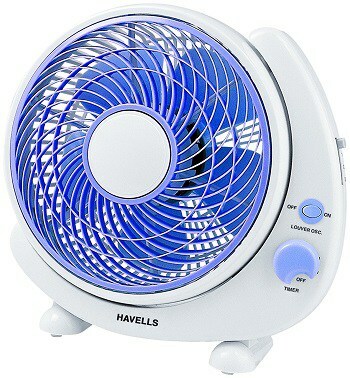 1) In case you have an extremely compact space, then this table fan from Havells should be ideal for its relatively smaller footprint. 2) The fan doesn’t look a conventional table fan and comes with a dual-tone finish making it look much attractive for its size. 3) Its small size also means that you have an option to mount this fan on a wall besides placing it on a table. 4) A revolving grill has been included to spread the air to cover a larger area and it comes with 3-speed operations allowing you to choose the ideal setting based on the weather. 5) The company has included a number of measures to ensure your safety and its fan runs at 1350rpm while consuming about 38 watts of power. 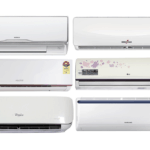 6) A standard warranty of 2 years is offered by Havells. 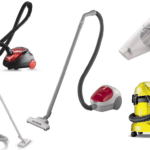 1) Those looking for a pedestal fan on a budget may want to have a look at this product from Varshine that offers some of the best features for its price point. 2) Being a pedestal fan, you can expect a much higher placement of the fan when compared with the usual table fans that are generally smaller in size. 3) You can easily adjust its height as per your need and preference. 4) Its blades are specially designed by the company to make the breeze reach every corner of the room. 5) Even its motor is of high quality, made out of copper winding along with a unique lubrication system that extends its life significantly. 6) The pedestal fan is compact enough to fit at any corner of the room without claiming much space. 1) Towards the more premium side of the spectrum, Luminous offers one of the best in class table fans currently available in the market with its Mojo Plus series. 2) The said table fan not only looks elegant with its dual-tone finish, it is quite compact despite its sweep span of 400mm. 3) The outer shell of the fan is made out of aluminium, which is much more durable than plastic. 4) Not only is the fan great to look at, but is also powerful enough to circulate air throughout the room. Its motor is capable of running at 2100rpm that is significantly higher than any other conventional table fan. 5) While running at its top speed, which can be controlled via the included knob, the fan remains silent minimising any disturbance. 1) This particular product line from Maharaja has proven to be extremely popular among the customers, thanks to its superior feature set and modern design language. 2) It has its outer body painted in grey and white that are non-intrusive colours and should go with all kinds of décor in your room. 3) Plus you can rest assured that the air delivery will be made across the opposite corner of the room. 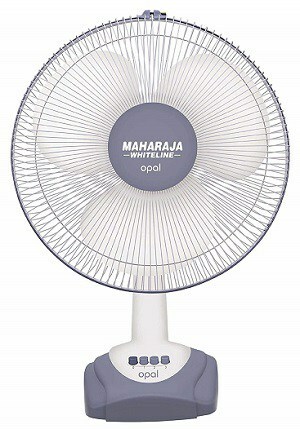 4) This table fan from Maharaja consumes just 55 watts of power which is better than other similar products of this size. 5) The base of the fan is large enough to adequately balance the fan and it also includes a handful of buttons to control the fan speeds, etc. 6) Maharaja offers a standard warranty of 2 years with this product for your peace of mind. 1) Solving multiple purposes at a time, this fan from Sonya can be used both for hanging on a wall and placing it on a table. 2) While in both positions, the fan can use its oscillating feature to ensure air flow around the room for all the people sitting in a room. 3) With that, you can even adjust its angle for a better-directed air flow. 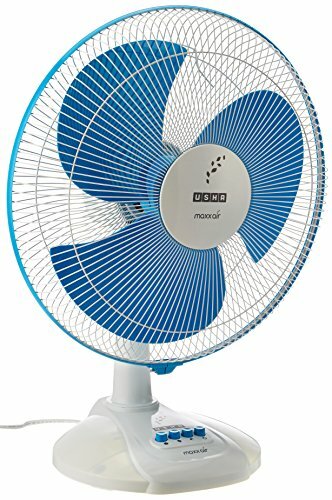 4) The company has included a high-speed motor to power this fan and it comes with an option of using a thread-based system to turn on or off the fan. 5) A 3-speed controller has been included to set the fan speed as per your need and number of people in the room. 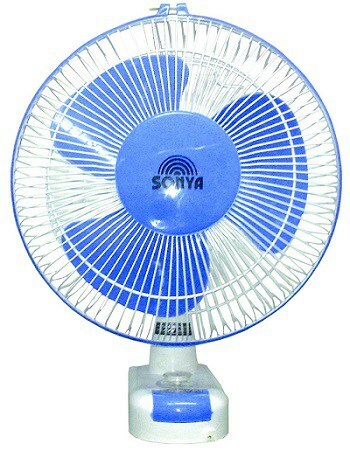 6) Sonya has made a compact table fan that is easy to move around between rooms, obviously when placed on a table. 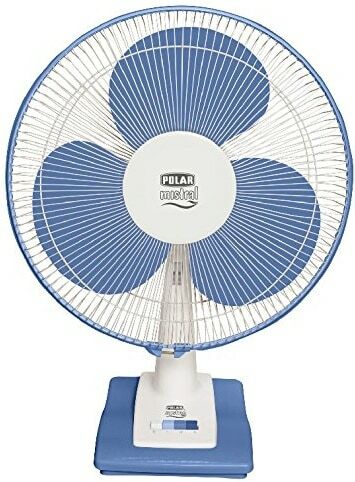 1) Polar’s compact table fan boasts a tried and tested conventional design for best in class results with an air flow that serves all the people inside a room. 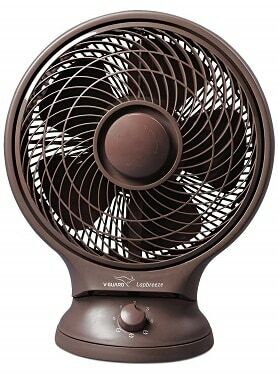 2) A wide base has been included to provide proper stability for the fan ensuring that it doesn’t trip over when in use. 3) Silent operation is one of the many features of this table fan and you wouldn’t face any disturbance while this fan does its job in the background. 4) The oscillating feature not only makes air delivery possible in every corner of the room but also works without any noise of itself.